NEW ITINERARY FOR 2019 TOUR. Bhutan is a magical country to travel through and especially by bike. Being able to see, smell, hear and taste all that is going on around you is the only way to experience such a place. The outstanding beauty of the big Himalayan mountains, the lush green of the valleys, the amazing architecture and the simpleness of life are things that are experienced every day when traveling through Bhutan. From the seat of your bike you will be constantly aware that this is no ordinary tour. We have a brand new itinerary for the 2019 May trip. This is the height of spring in Bhutan which brings the splendor of the country in bloom. Rhododendrons and Magnolias abound. This new tour is 16 days long and the trip starts from Guwahati (pronounced go-hut-i) the capital of Assam in Indian’s northeast, from where we will be picked up by my Bhutanese guiding partners in our tour bus and drive north to the south eastern boarder of Bhutan. Over the next 5 days we travel through the eastern corner of Bhutan, the country’s least visited area. We will ride up and over the Thrumshing La at 3780m, Bhutan’s most spectacular pass, while crossing into Central Bhutan. A night will be spent in the remote Tang Valley, before heading to Jakar in Bumthang. Here we will spend 2 days visiting some amazing Dzong’s (monasteries), sample local beer, cider and cheeses and ride places that very few westerner’s have even seen. And a little rest too as it will be well earned by now! The passes get slowly lower from here at 3600m and 3400m as we are heading west to the stunning Phobjikaha Valley via Trongsa. Phobjikaha is the winter refuge of the Siberian Black Necked Crane. Next stop will be Punakha for 2 days. Here we will visit the most spectacular Punakha Dzong in Bhutan. The epicentre of Buddhism in Bhutan. We will also get to ride fantastic ancient trails and possibly visit some remote alpine hot springs!! Next it’s off to Thimpu, Bhutan’s busy little capital. Just one night here before we head to the Paro Valley where we will hike up to Taktsang, The Tigers Nest, to view this icon of Bhutan’s history. 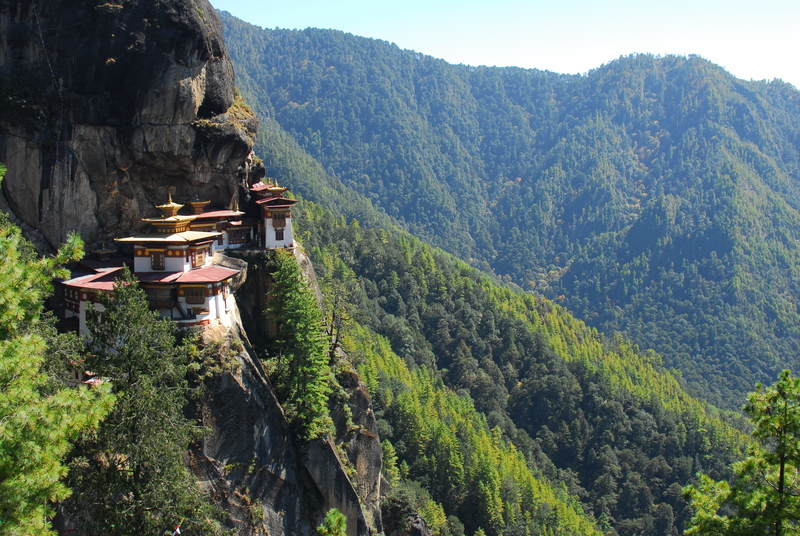 Taktsang, above Paro Valley, Bhutan. 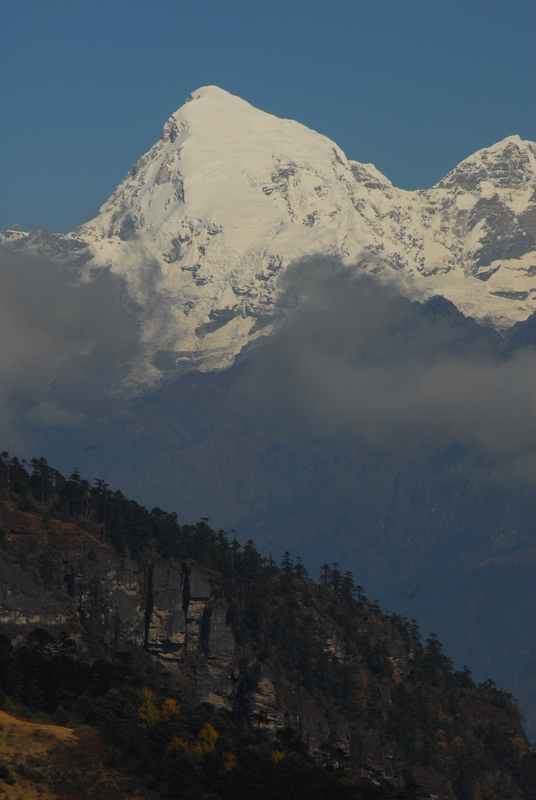 Our last full day will be viewed from the highest motorable pass in Bhutan, the Chelli La at just below 4000m, where we will get to see the stunning Jhomolhari, weather permitting, standing at 7300m. Then we cap off the day with a 1800m downhill! Day 16 will be to fly out of Bhutan. The majority of accommodation is in comfortable hotels, a few nights of ‘Glamping’ (that’s glamorous camping) are planned for in the beginning of the trip. We have a bus to carry all our baggage and our bodies and bikes if and when we get tired. The food is fantastic and there is plenty of it. Please get in contact for latest pricing and tour dates.